Shawn has always liked to build things with wood. When we first married, he would watch The New Yankee Workshop, learning from Norm Abram how to build benches, tables, and desks. He watched this for fun. I couldn’t understand any of the tools and ways of doing things, and I couldn’t understand how he found this entertaining. But I’m glad he did. He knows a bunch of stuff. Shawn built lots of things, even as a kid. A wooden reindeer, a tiny rocking chair – just because he felt like it. In passing along this tradition, Shawn and Noah worked together to build a birdhouse a couple of years ago, and hang it on the tree in our front yard. Last year we had a tiny bird family living in it. So cute! We’ve been looking for birds in there this year as well, and saw some signs, with bits of straw hanging out of the “doorway.” We weren’t the only ones aware of the new birds. A neighborhood cat, who comes to visit our Meatball, (visit meaning the two of them watching each other through the front door and windows) also saw this and assumed position. 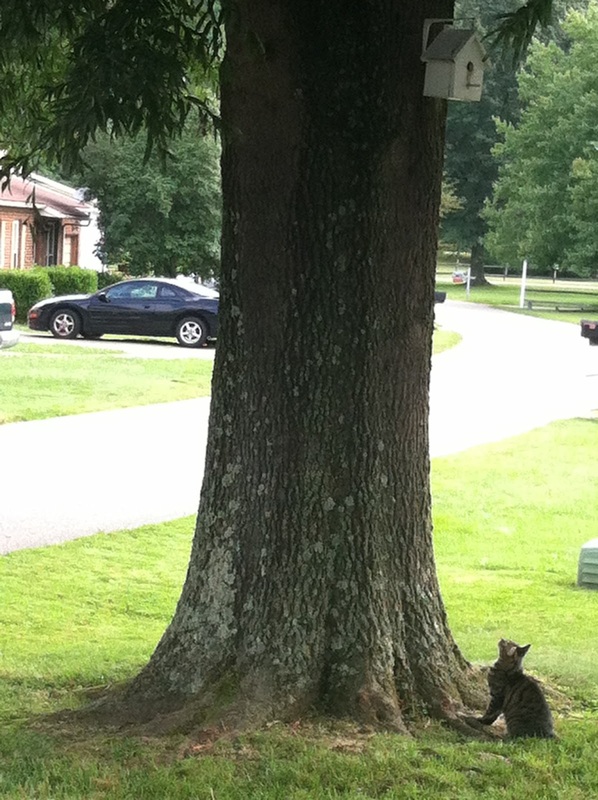 He stayed at the base of the tree, looking up longingly at the birdhouse for the better part of the day. When the cat would get distracted for a second, the mama bird (or papa bird – not sure about the family dynamics or parts of birds) would sneak in quickly to get to the babies, giving them a bite to eat. As I watched that cat, and how intent he was on making sure he didn’t miss an opportunity to pounce n those birds if they would get close enough, I was reminded of somebody else. It was a real-life reminder for me to keep my eyes open. I have written along this topic before, but sometimes a reminder is good. Being self-controlled, according to some random, free dictionary online, means restraint exercised over one’s own impulses, emotions, or desires. How do we become self-controlled? Pray for God’s help. He loves to give it. Have a friend or two who will keep you on track, asking how you are doing in whatever area you need more self-control in. And don’t give up when you mess up. Ask God for His forgiveness and keep going. Being alert, according to another random, free dictionary online, means being quick to notice any unusual and potentially dangerous or difficult circumstances; vigilant. How do I make myself quick to notice any usual or potentially dangerous circumstances? An answer to most spiritual questions is to read the Bible, and I think it fits perfectly here as well. That’s the best way to know what it is God wants for your life, and the things that He knows aren’t good for you. Pray. A lot. The more we talk to God and get closer to Him, the more we learn His voice. And always listen to the Holy Spirit. When you get the feeling to not do something, don’t dismiss it. When you begin to justify what you are about to do as “probably okay,” pray instead. It isn’t worth it. I have dismissed that feeling and justified my actions more times than I care to admit, and I can only imagine the hurt and pain I could have saved myself and others if I had lived out this verse and been alert. God doesn’t want that pain for us. He has these guidelines in the Bible to keep us from it. Trust Him to give you what you need to avoid it. Listen to Him.